Video of apartment fire as the fire is declared knocked down by interior crews at 225 South Rohlwing Road in Palatine. 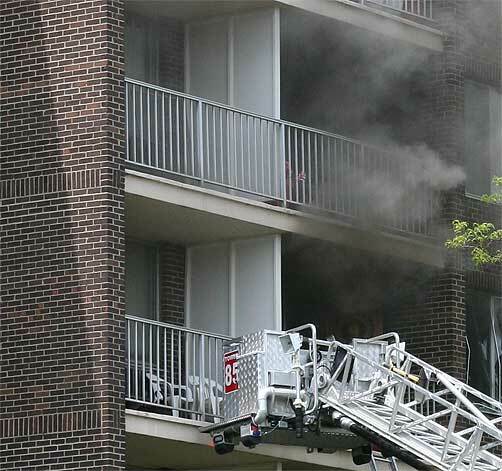 A second apartment fire of the day in Palatine broke out about 1:15 p.m.
Tuesday at 225 South Rohlwing Road [MAP/SAT]. Upon arrival, firefighters reported smoke showing out of fourth floor windows of the north wing of the six-story brick multi-unit apartment building. The alarm was raised to a second alarm because of heavy smoke and rescues. At least three people were transported to the hospital. One woman was reported in serious condition. Palatine Tower Ladder 85 adjacent to a fourth floor balcony while Palatine firefighters knock down a blaze in the apartment. Additional firefighters were also used for overhaul. A tower ladder, a quint ladder and an extension ladder from the ground were used for access to the fourth floor. Grove Village, Lake Zurich, Mount Prospect, Palatine Rural, Long Grove, Rolling Meadows, Schaumburg, Streamwood, Wheeling, and Wood Dale assisted Palatine Fire Department.